For the month of April, I am so happy to be participating in the One Room Challenge™ which is hosted by the very talented Linda from Calling it Home. I’ve been following the ORC for a long time, and I’m thrilled to be participating in this challenge as a Guest Participant. 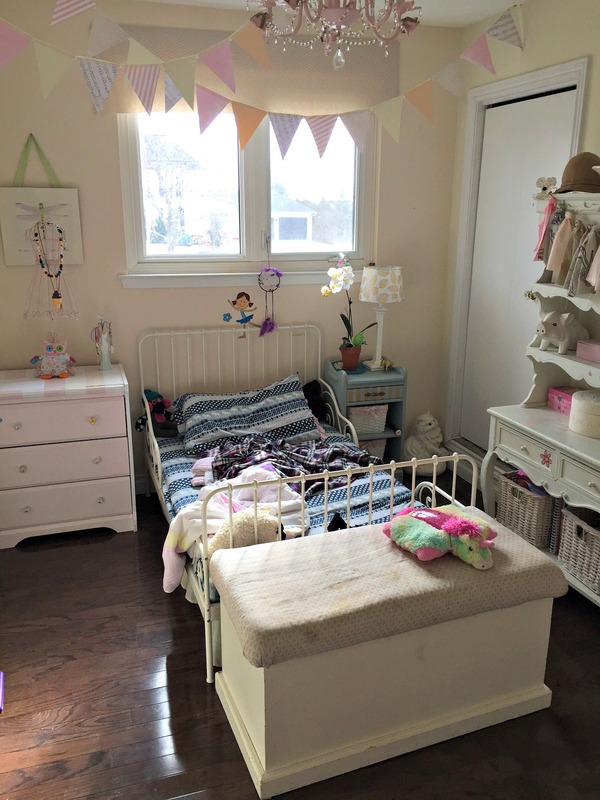 I’ve chosen to complete a Girl’s Bedroom Makeover for my youngest daughter’s room (aka the smallest bedroom in the house), and I can’t wait to dive into it and get my hands dirty. I’m calling this space “Preppy, Stylish & Modern”. This mood board represents my design plan for the room. I fell in love with a comforter from Target that had these vibrant colours in coral, mint and jewel toned green; and my daughter LOVES it too. This mood board surprisingly also meets her criteria for “a room that’s not too girly… but is a little girly… but a little tom-boyish…but with pretty things…” Are you confused by what she wants? Anyhow, she loves this mood board so I’m forging ahead. I can’t wait to see this room come together and you’re going to see it all happening week by week. 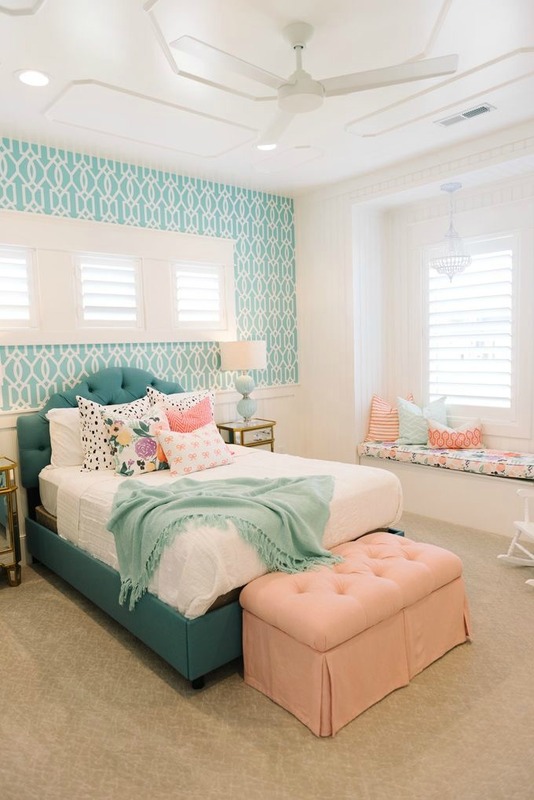 This gorgeous room was created by Four Chairs Furniture and is the inspiration for my daughter’s room makeover. I absolutely love all the white in the room, and the wallpaper accent wall. 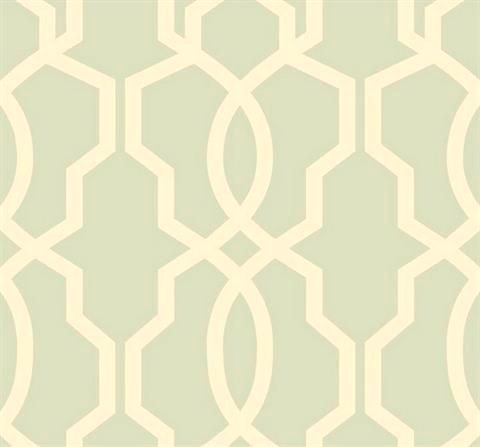 I found this stunning mint coloured trellis wallpaper at Home Sense and knew it would be the perfect jumping off point for the room. Here is the space that I will be transforming. The concept of the ORC is simple and it takes place over 6 weeks. The first week (this one) is to introduce the space that will be transformed and the project plans. The design concept and mood board is presented, and then each week a new project completed for the room is showcased. The final room reveal will be on May 10th, and there will be links to other blogger’s rooms where you can check out their progress throughout the challenge as well. I love the colors. They are fun and won’t date any time soon. Looking forward to seeing your projects and the big reveal. Love your design plan for this room! The color scheme, wallpaper, bed! Can’t wait it see it all progress! 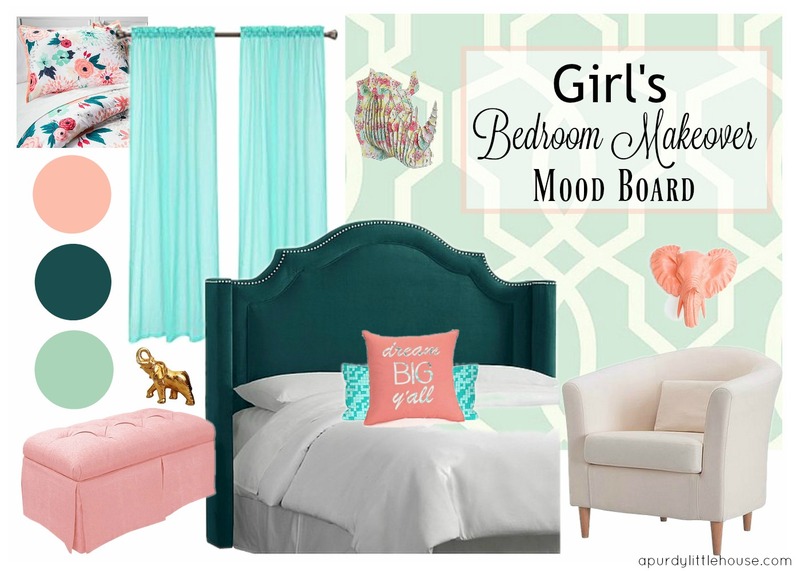 Ok your mood board is fabulous! I love everything you choose and even how you displayed your mood board. She is going to fall in love with her new room. Her room is going to be precious! 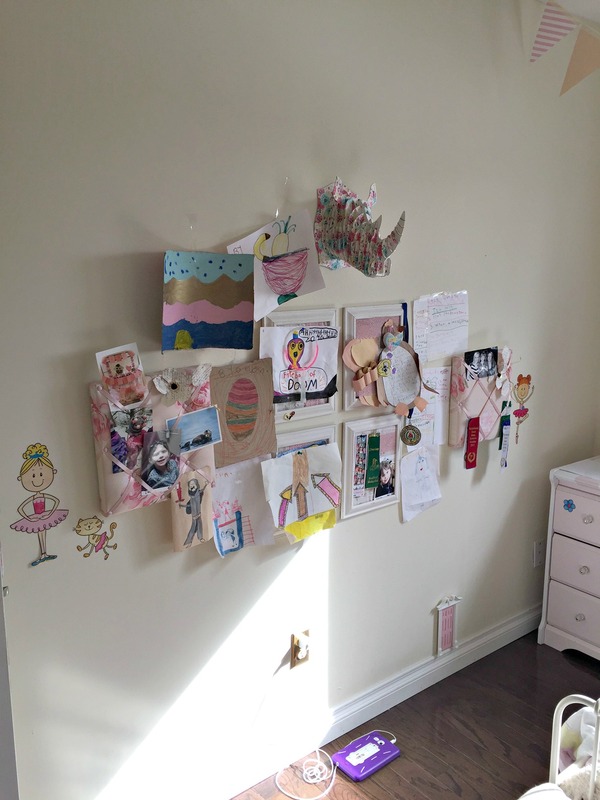 I love all the ideas and the floors in her room are already amazing! That headboard!!! All the heart eyes! I love this! We are getting ready to move my two year old into a bigger bedroom, because we are expecting #2 in September. If the next one is a girl, mint and coral are my color choices for the nursery! Also, totally random, but I have those flower pictures that are hanging in your daughter’s room. I was planning on painting the frames pink and putting them in my toddlers new bedroom. So, it’s nice to actually see them in pink! Can’t wait to see the transformation! Congrats on baby #2!!! So exciting 🙂 I found those prints at a thrift store at least 10 yrs ago and they fit right in with my daughter’s pink and taupe room at the time. They work so well with a shabby chic style room. I LOVE your plan! I kinda want all of this for my room! I love the comforter and wallpaper. I can’t wait to see how it turns out! Good luck! I love the color combination and the pretty wallpaper. Looking forward to following along and excited to see the reveal! I totally love this vibe!! Okay, you win the internet… that mood board is stunning. I don’t know what girly but not too girly means but you nailed it. I love the bedding, and the wallpaper, and the pink. I can’t wait to see how it turns out! Ooh, the color combination for this space is beautiful! I can’t wait to follow along and watch it all come together. Thank you Katie. I’m so excited to get started.